Selecting patients in ChiroPad EMR is easy. You can select them by typing a few characters of their last name. For example, to choose "John Jones", you might type "jon/j" and press <enter>. You can also sign in and choose patients from the appointment book. (Of course, the appointments are fully integrated throughout your network with ChiroOffice. As seen in the animation below, adding a new complaint is easy with the context-sensitive graphical views. Touch an area and you will see complaints typically associated with that area. Click the desired complaint. 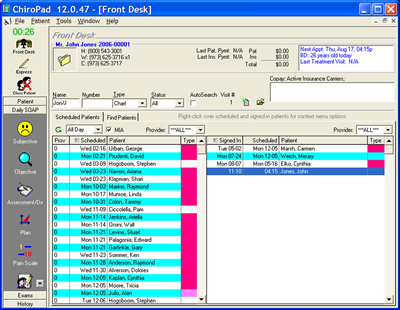 When you select a patient, patient windows automatically popup for your review. Make any changes needed. The user interface is simple. Lots of power exist in ChiroPad's design, but you'll appreciate the idea that the features don't stare at you at one time. Notice the tab folder on the window. You'll see the primary information immediately displayed. When you want to describe radiating pain (in a detail set which is the next tab folder), you choose the different tab folder and edit this information. You can select factors that aggravate and relieve a condition. Notice the tab folder in the middle that has the "Aggravate/Relieve" folder selected. Of course, all information can be customized in the 32 bit ChiroPad EMR. Notice that all segment levels can be used. Other products limit you to commenting on just 3 levels. ChiroPad's view provides 30 discrete levels, including the left and right ilia. 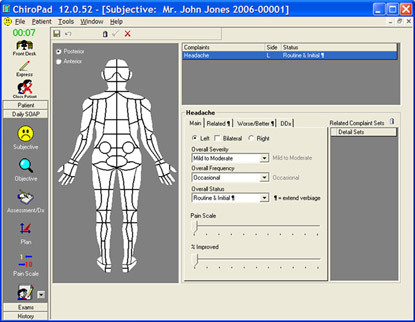 The view is expanded to 1024x768 for a full spine view without scrolling. Legends that explain the paraspinal and subluxation listings make it easy for new users, or new doctors who join your chiropractic practice. The L6 transitional segment is included but with an intelligent warning system such that a button or checkbox is not required.